Something “funny” that just happened: I got 1,200 words into writing a review of Firewatch before realising that it is Campo Santo’s first game and that they didn’t make 2013 house-exploration simulator Gone Home first. This is annoying for two reasons: first, I just wasted like forty-five minutes writing a bunch of words I can’t use; and second, I don’t think I can review Firewatch now. Not fairly, anyway, since while I was playing it my reactions were being shaped by certain things Gone Home did and didn’t do, and I don’t think I would have treated it the same way if I’d known it was an independent product rather than a followup. Long story short, Firewatch relies on two strengths: its looks, which are unfailingly pretty if a little technically limited; and its story. I thought I knew the bounds of where the game would go with that story based on Gone Home; instead I was very badly mistaken and anything could have been possible, and I think that element of uncertainty would have materially changed my impression of the game. Unfortunately without access to some sort of mind-wiping device I can’t go back and re-experience Firewatch’s story for the first time, so I think a fair review is now out of the question. Instead, let me give you a one-paragraph opinion: Firewatch is an at-times maddeningly basic game with good writing that touches distressingly on the messy fact that real life is complicated and that unpleasant things can happen to the best of people for no good reason. 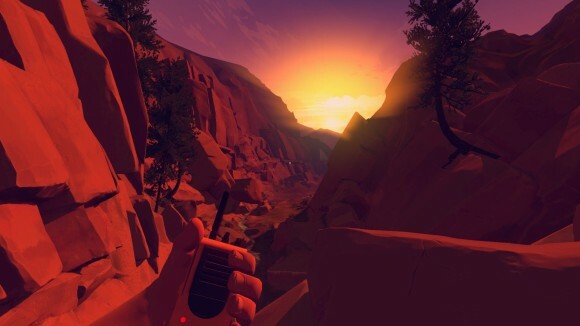 Most games (and most media, for that matter) refuse to acknowledge this at all, and it’s refreshing to play something that tells a real, human story; Firewatch is valuable because it’s one of a very small minority of games that takes the time to do this in an intelligent and sensitive way rather than falling back on tired old tropes and relying on more fantastical elements of the setting to carry the player’s interest through to the end. It’s only three hours long — and that’s padded out by having you backtrack across the map several times — but it’s definitely a worthwhile experience nonetheless.